In a word, the style of the campaign promises to be vicious. The campaign’s substance—if it can be said to have any—will be populist. The word populist comes from a Latin root meaning “people.” When applied to politics, the word connotes a relentless emphasis on the people (always vaguely defined) and threats to their well being (whether real or invented). Populist politicians present themselves as one of “the people,” portray their opponents as out of touch with “the people,” and define political questions as a struggle between “the people” and the elites and “special interests” who would exploit them. In the months to come there will be countless charges and countercharges about concrete political issues, e.g., the state’s debt crisis, rising tax rates, the death penalty, and gay marriage, to name only a few. But one issue will both permeate and transcend all others: which candidate will be more responsive to “the people”? Or more simply, which candidate is more truly one of “us”? The Tribune is almost certainly correct in its predictions. The campaign will be a street fight. And its primary message—its all pervasive message—will be populist. Because I am a historian, however, I think that historical perspective can help us in thinking about this present moment. There is nothing new about vicious, populist campaigns in American politics. Indeed, they appeared on the scene pretty much simultaneously with the rise of American democracy. If anything, twenty-first-century elections are dignified and well-mannered in comparison with those of two centuries ago. I am mindful of this because my class on U. S. History here at Wheaton has just finished an in-depth review of the presidential election of 1828. The 1828 election was an important transitional milestone in American political and cultural history. It is easy to overstate the case, but it is not too much of an exaggeration to describe politics prior to the 1820s as a gentlemen’s affair. By the culmination of that decade, however, the political world as we know it was coming into focus. In colonial America, political campaigns—at least as we would define them today—did not exist, nor did formal political parties. On election day, eligible voters (i.e., white male landowners) would congregate at the county seat and learn which of the local gentry had agreed to “stand” for office. According to custom, the candidates would rarely speak on their own behalf. An individual who desired office was presumed to be power-hungry, and thus disqualified from the public trust. The absence of speeches was made up by a great deal of drinking, however, since custom dictated that the wealthy nominees “treat” the voters to large quantities of free alcohol. When George Washington was a candidate for the Virginia House of Burgesses in 1758, for example, his personal papers reveal that he supplied voters with 28 gallons of rum, 50 gallons of rum punch, 34 gallons of wine, 46 gallons of beer, and two gallons of “cider royal.” (This amounted to a total of 160 gallons for 391 registered voters, or about 1 1/2 quarts per voter.) A few years later, James Madison, the future father of the U. S. Constitution, also ran for the House of Burgesses but followed a different strategy. Madison was disturbed by “the corrupting influence of spirituous liquors.” He viewed the tradition of “treating” voters as “inconsistent with the purity of moral and republican principles.” The future U. S. president was committed to “a more chaste mode of conducting elections” and declined to treat voters. He was defeated. Beyond the flowing alcohol, the most prominent feature of colonial elections was how deferential and personal they were. Voters took for granted that candidates would come from the social elite—the oldest and wealthiest families. And because there were no established political parties in colonial America—and no party platforms—almost the only “issues” in an election involved the character of the candidates involved. To put it differently, colonial politics was largely a politics of reputation. According to the dominant political values of the day, the only non-negotiable prerequisite for public office was virtue—the willingness to sacrifice self-interest for the common good. And because it was assumed that the local elites who stood for office would frequently understand political issues more thoroughly than their neighbors (thanks to superior education and the leisure time necessary to stay well-informed), it was assumed that virtuous officeholders would sometimes have to contradict the wishes of their constituents. 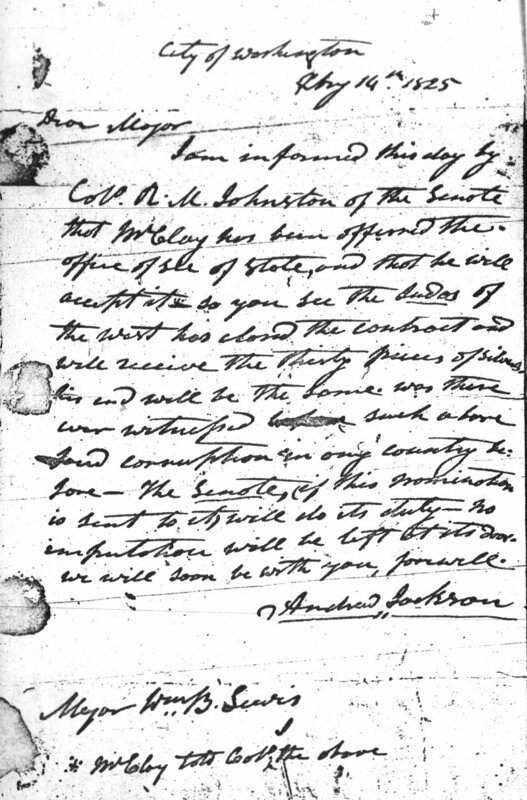 And so in 1796—after George Washington announced only two months before the election that he would not stand for a third term as president—the presidential “campaign” that ensued primarily involved prominent men writing private letters to other prominent men about the qualifications of the leading contenders, John Adams and Thomas Jefferson. Four years later—when the same two statesmen again squared off—the same elitist air survived but had weakened. In addition to writing letters, interested statesmen were now more willing to write public pamphlets, and the country’s small but growing number of newspaper editors was beginning to weigh in as well. The times were changing. Yet as late as 1824 the aristocratic tone of presidential elections largely survived. State laws had changed in the intervening quarter century, so that now most presidential electors were to be popularly elected rather than appointed by the state legislatures. Even so, scarcely a fourth of eligible voters bothered to cast ballots in 1824, and campaign managers for the various candidates still assumed that the “public opinion” that needed to be courted was the opinion of the wealthy and powerful. For their part, the rest of the electorate seemed not to care. This changed in 1828. Describing the change is easy. The number of votes cast more than tripled, and all across the United States a much broader swath of adult white males paid attention to national politics than ever before. Why this occurred is a complicated question. There were several factors at play, but for our purposes, one factor is paramount: the outcome of the 1824 election and the way that one candidate and his supporters responded to it. But neither Jackson nor his supporters ever accepted the validity of the outcome. 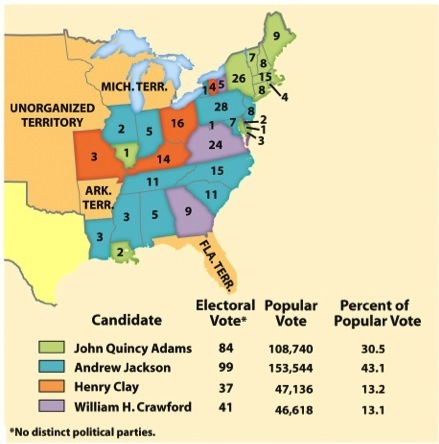 Jackson had finished first in the popular vote (with about 43% of the total) and nothing else mattered. 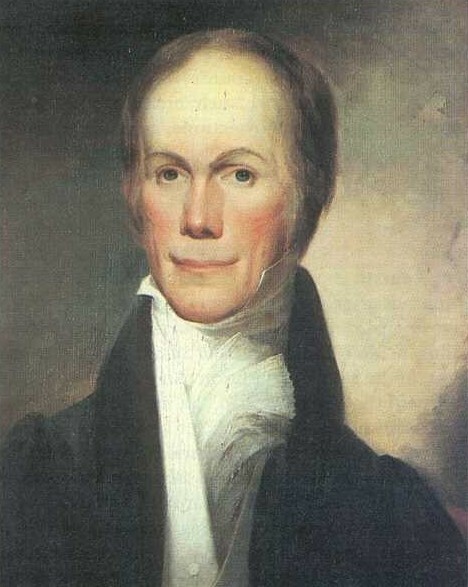 Days later their anger turned to outrage, when president-elect Adams named Henry Clay as his future secretary of state. Because Clay had cast his support to Adams on the eve of the run-off, Jackson and his supporters concluded that there had been a backroom deal, that Adams had bought off the Kentuckian with the promise of a plum post in his administration. Although no “smoking gun” ever proved the (probably false) allegation, the Jackson camp screamed “Corrupt Bargain!” and the charge stuck. 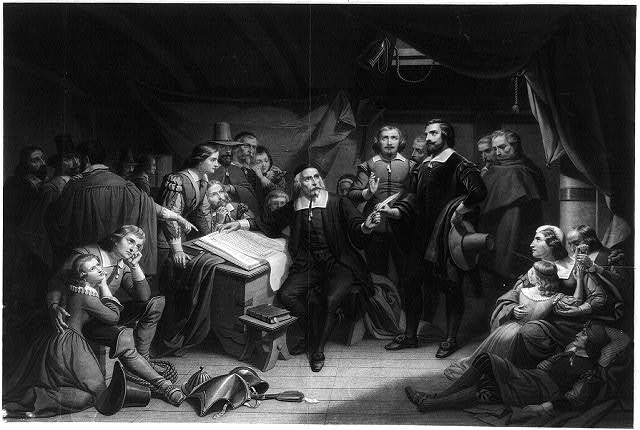 Although Adams and Clay were both supposedly parties to the dastardly deed, the Jacksonians reserved their greatest scorn for Clay, whom Jackson privately labeled “the Judas of the West.” Clay had justified his support of Adams by questioning Jackson’s fitness for the presidency. The Tennessean was a “military chieftain,” Clay had declared in a public letter, and history was full of military leaders who had begun as heroes and ended as tyrants. 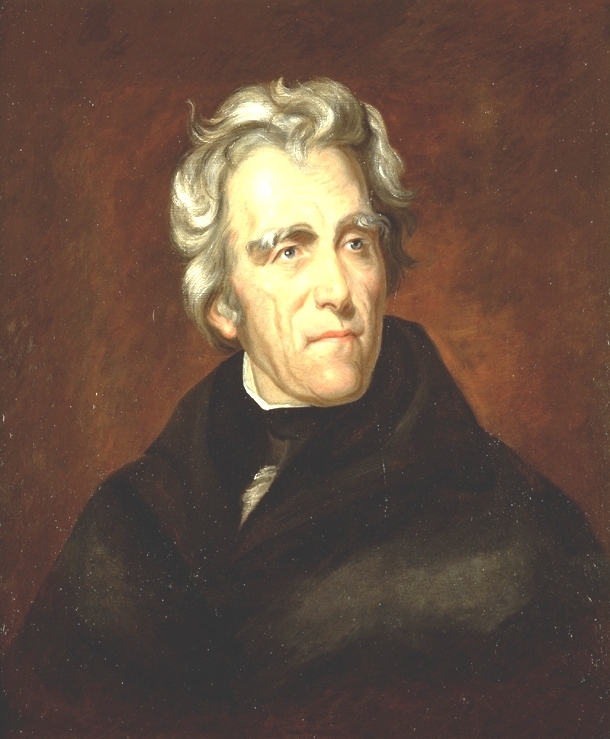 The House Speaker strongly implied that a Jackson presidency would end in the downfall of the republic, and his conscience would not allow him to stand idly by if it was within his power to prevent such a tragedy. Four years later, Jackson would have the chance to vindicate both himself and the “majesty of the people.” He was again a candidate for president, this time in a head-to-head match-up against the incumbent Adams. The 1828 presidential contest would be one of the dirtiest campaigns in history. One historian of the election has written that it may have “splattered more filth in more different directions and upon more innocent people than any other in American history.” As with earlier presidential elections, it was a campaign of personalities. What was new in 1828 was how public the charges and countercharges would be. Four years earlier, Henry Clay had hinted that Andrew Jackson could not be trusted. In 1828, his political rivals went much further. John Quincy Adams’ supporters condemned the general in no uncertain terms: Jackson was the son of a prostitute and a slave, they announced; he was an adulterer, and he was a murderer. The adultery charge was dredged up from more than three decades earlier, when Jackson had unwittingly married supposed divorcee Rachel Donelson on the Tennessee frontier before her divorce had been officially approved by the Kentucky state legislature. The murder charge referred disingenuously to executions that Jackson had ordered during his military career. 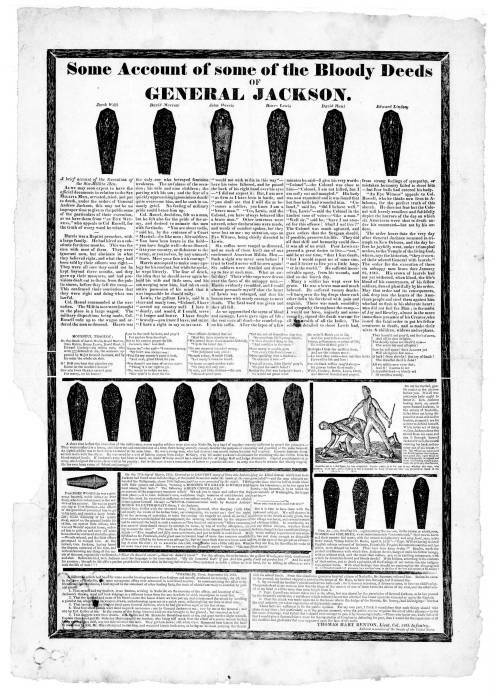 The Adams camp highlighted the latter with an infamous broadside now remembered as the “Coffin Handbill,” a poster featuring some seventeen coffins in silhouette, one for each man the blackguard Jackson had supposedly cut down in cold blood over his lifetime. The Jackson campaign counterattacked with admirable creativity. They led with the accusation that Adams had stolen the presidency four years earlier, a claim valued less for its truthfulness than for its effectiveness. Beyond that, their strategy was clearly to show that the incumbent president was an effete intellectual out of touch with the common man. Adams was a Harvard graduate who spoke multiple languages and boasted an extensive record of public service. He had served as both congressman and senator from Massachusetts; as ambassador to the Netherlands, Prussia, and Russia; as Secretary of State; and now, of course, he occupied the White House. John Quincy Adams’ silk underwear disqualified him for the presidency, in the view of Jackson supporters. Fifty-six percent of voters chose the fighter. We’ll discuss the implications of that decision next time. A good friend of mine had a heart attack two days ago. For twenty-one years James Felak and I were colleagues in the History Department at the University of Washington. For most of that time, James was my only close Christian friend in a research institution that boasted some three thousand full-time faculty members. I haven’t been able to talk to James yet, but my understanding is that his prognosis is encouraging. Yesterday he asked for coffee and a laptop, and I count that a good sign, if more than a little premature. Two posts ago I began a series of reflections on “The Church and the Christian Scholar.” In that context, I want to pay tribute to James publicly, for he has both encouraged and challenged me greatly over the years as I have tried to figure out what it means to be a Christian scholar. The Scripture calls believers to “walk worthy of the calling” with which we have been called, but it does not call us to walk alone. In James, I encountered another Christian scholar willing to walk alongside me, and I will be forever grateful. James joined the UW faculty the year after I did, and we eventually became fast friends. I remember distinctly the first time we really connected. A few months after James’s arrival, Seattle was hit by a freak snow storm. (It rarely snows there, and large accumulations are almost unheard of.) I had walked to the graduate library after lunch on a cool, damp, overcast day, which is another way of saying that it was a typical winter afternoon in the Pacific Northwest. After six hours of reading microfilm, I came out to find that there was already 8-9 inches of snow on the ground, the public bus system on which I depended was effectively shut down, and I had no way of getting to my home some thirteen miles from campus. Expecting to spend the night in my office, I went to the student center to grab dinner before the grill closed, and there I happened upon James, who was doing course prep at one of the tables there. I knew that James lived a couple of miles away and regularly walked to work, and so I asked if I could sleep on his couch for the night. He readily agreed. I’ll never forget the trek to his house that followed. Neither of us was dressed for snow, which was by now up to our shins. We were walking in regular street shoes and thin jackets, the wind was howling, the snow seemed to be coming almost horizontally–so thick that we could hardly see–and what was most bizarre of all, the entire sky was repeatedly illuminated with truly awe-inspiring flashes of lightning. I was miserable, weary, and more than a little distracted by the prospect of being electrocuted in a blizzard. But not James. James was energized by the opportunity to talk about ideas–his lifelong passion–and talk he did. Although the wind and thunder were often so loud that he had to shout into my ear, James excitedly shared his views on Communism, socialism, Christianity, the Cold War, East European history, and the conjugation of Hungarian verbs. I was simultaneously flabbergasted and enthralled. We have been friends ever since. The conversations that followed over the years were less memorable but more meaningful. As we discovered our common faith, the focus of our discussions centered more and more on the question of calling, and in particular what it meant for us to labor faithfully in the academic contexts in which God had placed us. These conversations were inspiring and revitalizing, and I could have them with no one else. Along the way, James challenged me in a number of specific ways. First, he called me to take seriously the wisdom of Christian writers over the centuries. Ironic for a historian, there was an element of “historylessness” (to quote sociologist Sydney Mead) in my approach to the faith. Like most American evangelicals, I paid attention to the history of the early church as revealed in the New Testament, but once I finished the book of Revelation I jumped to C. S. Lewis and Billy Graham. James invited me to meet with him regularly to discuss various Christian works, and the first suggestion on his list was the Confessions of St. Augustine, a sixteen-hundred-year-old work of startling contemporary relevance. Thank you, James. Thank you, Lord.